Aeration is a process, which helps in the enhancement of concentration of dissolved oxygen in water. This concentration of dissolved oxygen (DO) is required for sustaining aquatic life and is also considered as an indicator of the quality of water. The DO can be enhanced by using either mechanical aerator or by hydraulic structures. Hydraulic structures accelerate the water–air–mass transfer by entraining a large amount of air in the form of bubble, thus increasing surface contact area for full oxygen transfer. Commonly hydraulic structures used for aeration are weirs, spillways, cascades, water jets and close conduit flow arrangements, etc. When the performance of weirs is compared with other aerating agents like hydraulic jump, labyrinth weirs, chute etc., it was found that weirs give maximum oxygen transfer efficiency. The researchers have used rectangular-, triangular-, trapezoidal- and semicircular-shaped weirs for DO studies in the past. The present paper looks into the literature review of weirs having free surface when employed for aeration purpose for wastewater treatment. It was found that the triangular-shaped weir has created maximum oxygen transfer efficiency out of all other shapes of weir. 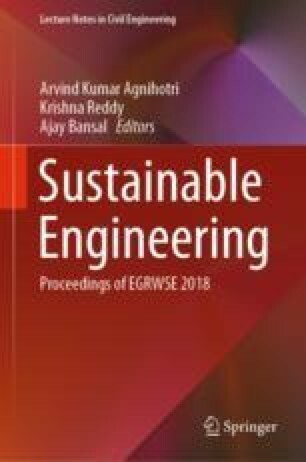 It is expected that findings of this study will help in the selection of particular weir configuration and shape of weir for creating maximum oxygen transfer efficiency in the rivers and streams for the purpose of treatment of water.